What is it like to hike 4 days and 26 miles to a wonder of the world? I have been asked often by family and friends what it's like to hike 4 days and 26 miles to a wonder of the world. There is no easy way to describe the experience but if you are in good health (even if you loath hiking) this is a must see that will hit many birds with one stone nourishing your mind body and soul in four days. I'm pulling this entry from my more detailed almost journal like blog that I've kept during my travels so I hope you enjoy and it persuades you to take this once in a life time trip. If you have doubts, I will tell you some of the greatest meals I have ever had were on this journey. Who doesn't want 5-course meals everyday while hiking? Our bus was scheduled to pick us up from our hotels at 4:30 AM. I slept through my alarm (which NEVER happens) and I woke up to my friend Liz knocking on my door at 4:37. Talk about stressful! This is not a trip you can sleep through and decide not to go. I flew out of bed and was in the lobby of the hotel in 7 minutes at 4:44 AM. Our tour guide Claudio still gave me a dirty look and all I wanted to say was "this is so not my nature or me and I'm not that person"....but I was too tired and I was internally quite impressed I was able to go from a deep sleep to out the door without an ounce of coffee in 7 minutes. There were 15 of us total and we went through a company called Valencia Travel. We took a 3.5 our bus ride to Piskacucho with a stop in Ollantayambo for a buffet breakfast along the way. We arrived at 0830. I had rented walking sticks, a sleeping bag and hiking boots in Cusco prior as it was cheaper than going through the rental company. Total cost was 65 soles which is $20.00 USD...what a steal. I also hired a "porter" who carried my larger items so I was able to hike the 26 miles with my day pack only. We had 21 porters total and the maximum weight that a porter can carry on the Inca Trail has been limited to 20kg. Porters are typically Quechua and ours ranged in age from 18-62-years-old. 62! I have developed HUGE respect for these men. They make this 26 mile trek several times a month while carrying massive amounts of luggage on their back, race ahead of us on the trail to reach the camp site first in order to put up our tents, prepare bowls of warm water for us to wash our hands upon arrival, make us tea, coffee and meals. We had our own chef named Freddy and I ate better on this trek to Macchi Picchu than I have in 4 months. We were served beautiful 4-course dinners every night. Our wake up times ranged from 3:00 AM - 5:00 AM and we were wakened with the porters knocking on our tents with coffee in hand. All I could think, is this is what it must be like to have a personal assistant and I can't lie, it was a really nice touch with limited sleep in a tent. These men were incredible and we were very good at saying "Solpayki" (Thank you in Quechua) as often as possible and show our appreciation. Day one was about 5 hours of hiking with a few breaks. It was not overly intense (depending on who you are asking) and we passed the Vilcanota River and and the Urubamba mountain range that divides the jungle, the andes and the snow capped peak of "Veronica Mountain." Once we arrived to our first camp site we had a 4- course dinner served at 6:00 PM and I was passed out in bed (meaning a tent and using my backpack as a pillow) by 7:00 PM. Our wake up time was at 4:00 AM and I was wakened with my cup of instant black coffee from the porters. Thank goodness because I tossed and turned all night and it was a COLD night. I'm used to camping in California. We had a lot of preparation from our guide in regards to the difficulty of day 2. Day 2 is about 11 hours of hiking and intense. After breakfast we started a steep ascent towards the highest pass (Abra de Warrmihuanusca or "Dead Woman's Pass" at 13,779 ft. The ascent is by climbing A LOT of stone inca steps. These are uneven and fluctuate in height and width with every step. Walking sticks were a very good idea. Once we reached the top, we felt a sense of accomplishment and enjoyed lunch. After lunch we made the long descent down to find ourselves making another steep ascent back up. In a way, going down was more painful than the climb up as your knees and joints feel it in every way shape and form no matter how old you are. On the way up to the second pass I passed humming birds and native plants. Our guide was actually incredibly impressed by our hiking skills and let us go at our own pace so I was often alone while hiking and it was incredible to be in such scenery alone and taking in the views. Our impressive hiking skills were probably aided that we have all been used to high altitude now for 2 months so we did not have to acclimate much compared to others who make this adventure. None the less, we chewed coco leaves often to help with the altitude. We reached out campsite at 5:30 PM and enjoyed another beautiful dinner and a special rum tea as a congratulations. The campsite had beautiful views and I literally felt like we were in the clouds. Its good for me to point out that minus the amazing meals and views this was not luxurious camping. We did not have showers and our toilets were nature and/or a whole in the ground. Its comforting to know we were all in the same boat and would smell together. I did wipe up with the little bowl of hot water the porters would give us upon arrival however. We were able to sleep in until 6:00 AM! What a luxury. The group started with a "gentle climb" to the archaeological site of "Phuyupatamarca" (meaning "Town in the clouds") in order to reach the third highest point of the trail. Day 3 was about 6 hours of hiking and we arrived at our third campsite early. What does one do when you arrive early to another campsite in the mountains? Naturally we did not nap and we voluntarily did more hiking to a waterfall where some brave souls went in the frigid water to clean up. On our last evening, Freddy our chef made us a special cake as a congratulations. I have NO idea how this man was able to make us 4 course meals twice a day under these conditions not to mention bake a cake in this altitude, but it was delicious. On our final day of hiking out wake up call was at 3:00 AM but I woke up at 2:30 in order to enjoy some instant coffee. This morning was pretty brutal as by day 4 we were all truly exhausted, smelly and getting cranky from exhaustion. With that said, there is something to be said for hiking at 4:00 AM in the dark and watching the sunrise come through the clouds. We received our first glimpse of Machu Picchu at 6:30 AM once we arrived at the "Sun Gate." We had a burst of energy as all of our hard work was beginning to pay off. By 7:30 AM we finally arrived to Machu Picchu and it is most definetly visually stunning and more epic than I thought it would be. Lack of showers, toilets, clean clothes were all worth it! Everything about the view was perfect. The mountains, clouds, trees, green grass and inca ruins were spectacular. The only downside was that it was busy and filled with tourists. We had been spoiled the last few days to be in this type of nature for the most part by ourselves. As we passed numerous tourists who had taken the train to Machu Picchu I think we all felt a sense of accomplishment and pride as we walked by smelly and exhausted from our hard work to get there as we passed other clean tourist with perfume on. We spent about 2 hours in the ruins exploring, learning the history of Quechuan people and the incas. By noon we were ready to get home, shower and have luxury items like a toilet. We took a bus to a nearby town, got lunch, took a 2 hour train ride to Ollantaytambo and then a 3 hour bus ride back home. I arrived home at 8:00 PM and absolutely exhausted and exhilarated to be taking a shower and sleeping in a warm bed. Glorious, committed, life changing. Life changing because when you are surrounded by supportive company and test yourself in any way only good and confidence can come from this. I had planned this trip last January and for a fleeting moment questioned why the hell I did not just take the train to Machu Picchu. I'm forever grateful I did not. 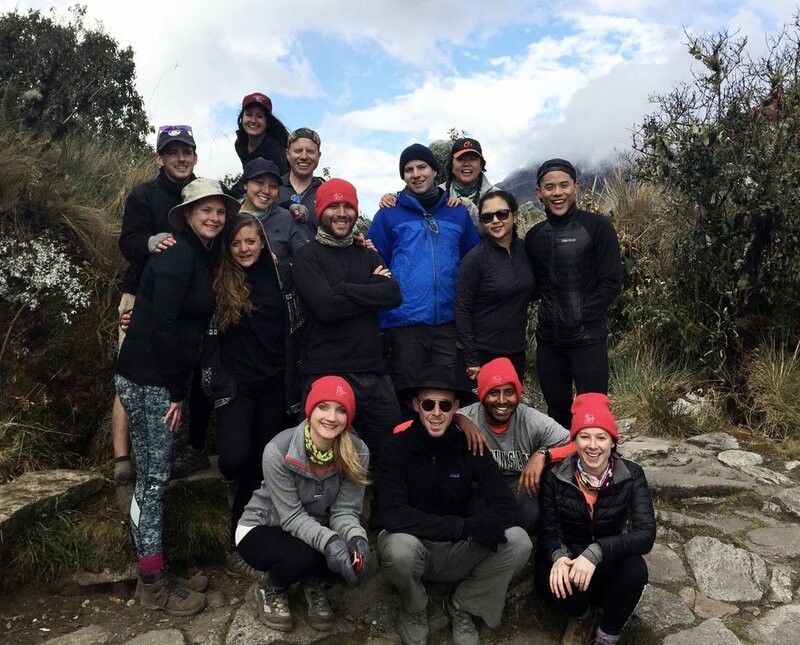 This hike is something to be done while young and fit and was a once in a life time opportunity for me to do this while healthy, here in Peru and in great company. It was challenging and difficult, but to be honest I enjoyed every part of the way (minus waking up at 3:00 AM.) I completely disregarded any pain I felt by taking in every aspect of nature I passed and I realize more and more each day that I'm so grateful to be enjoying a more simplified life without materialistic and fancy possessions in trade for memorable life long experiences. **Feel free to contact me if you have any questions on Machu Picchu!